My brother John was quite a prankster as a youngster. One year, he had an idea to pull a prank on Connie for Christmas. It was the year we moved into the new house and there were lots of leftover bits of this and that in the basement. Dad had recently installed a garage door opener and the box was just the right size for what John had in mind. 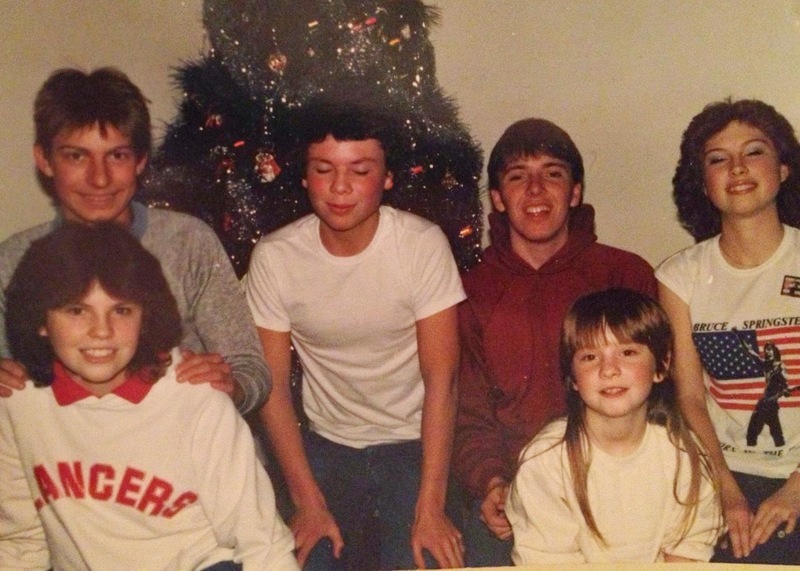 This Christmas photo was from approximately that era. Connie had been asking for an electronic keyboard for Christmas and John decided to set his plan into motion. He filled the box with leftover bricks (naturally) and carefully wrapped the box. (see First Day of Christmas) Then he had mom write on a gift tag "to our musical Connie". The box was hidden under the pool table in the family room - but clearly somewhere Connie would see it before December 25th. She saw the box. She took the bait. She thought she was getting a synthesizer! On Christmas morning, the presents were unwrapped one by one. It was finally time to get the "big" present from under the pool table. Connie excitedly ripped off the paper only to discover a box full of bricks and her brother laughing uncontrollably!